I was delighted this morning to see my Daily Design Files post in my inbox, as I am every morning. It has been my morning ritual for the last two and a half years, but this morning it was different. I was super excited. Lucy has come up with a great concept in conjunction with The Project Agency. 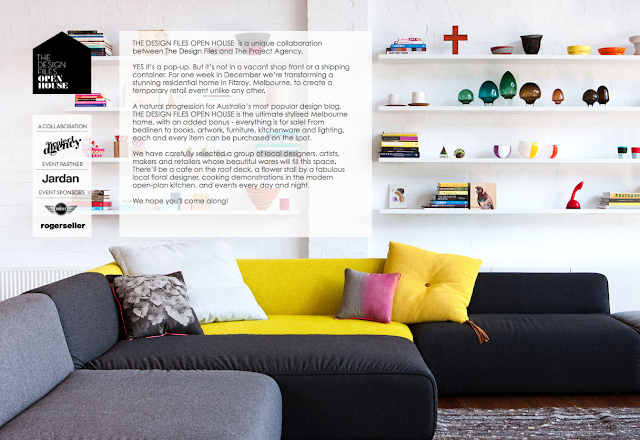 The Design Files Open House, a pop-up (which is all the rage at the moment), but this one is pop-up with a twist. This is not in a vacant shop, it is in a residential house! Running for four days from December 1-4, you will be able to buy the wares in the house. I mean everything and you can buy it on the spot and also online. This is an amazing concept. I am there with bells on! Check it out. It's such a great concept isn't it. Though I would expect nothing less from Lucy. Thanks for your kind words. Lucy was the reason I started blogging.